Highline Access in Smith Rock State Park – Slackline U.S.
As the crown jewel of highlining within the Pacific Northwest, Smith Rock State Park has a lot to offer, with dozens of established highlines, fantastic accessibility, stunning scenery, and a vibrant and highly active community regularly found pushing their limits within the park. Many highliners also find welcoming locals, diverse ecology, friendly park rangers, and an expansive variety of outdoor recreation activities of world class character. Not to mention a rich history of establishment and pioneering tracing back to the dawning era of our sport in the 1980s. If there was ever a class of destinations worth protecting for the future generations — Smith Rock is ranked among its greatest. Alongside all the perks, it is presently notable that times have changed a bit since the Smith Rock highlining free-for-all of years past. Currently, highlining remains allowed within Smith Rock State Park and the adjacent BLM land. Yet, newer State Park regulations and an ever present balance of concerns between different user groups require our mindful attention as practitioners. In response to these growing concerns and through community meetings and open dialog Oregon Slackline Access (OSA) was founded and is working to secure the future of highlining within the region. We are proud to relate that continuing discussions with Oregon Parks and Recreation Department (OPRD) continue to progress in a positive way. Below we offer a summary of the official regulations and best practice guidelines paired with a summary & projected future of ongoing Oregon access work. We ask that all slackliners respect State Park regulations and participate mindfully within the park. Many eyes are on highlining at Smith lately and our choices may either promote or damage the future of highlines within Smith Rock. Following is a summary of these regulations interspersed with the park’s rationale behind them and some additional notes. No Slacklines/Highlines over established trails, pathways, roadways, the Crooked River, and climbers access-routes. This regulation was mostly created as an attempt to curb potential highliner induced rockfall hazards. Rivers however are a special case as they are seen as a flight path for endangered falcons and eagles. No lines left up overnight [ except as follows ]. After 24 hours lines will be considered abandoned equipment. Highlines may be left up for 3 nights maximum outside of the raptor nesting season from July 31st – December 31st. Highline leashes must be removed or lines made otherwise unusable for the general public when not attended [ including overnight ]. Exceptions to the one day rule during nesting season Jan 1st – June 30th will be considered on a case by case basis as time allows. This builds upon day use and abandoned property regulations. Oregon Slackline Access has worked with Smith Rock management to permit the above seasonal exceptions. Please treat this regulation with the utmost respect. There is also an exception for gear to be stashed in a “discrete manner”(e.g. caves) overnight. There exists a temporary moratorium on new highline development. No new bolts may be placed pending the completion of studies concerning the flight patterns of certain species of endangered birds within the park. Government biologists have expressed concerns that endangered falcons and eagles may be impacted by rigged lines. Studies to assess the level of impact are ongoing and discussions suggest that this may be repealed upon completion of the Master Planning process in 2018 pending their results. Respect areas subject to seasonal raptor closures. These closures apply to nesting areas of endangered bird species so they may hatch and rear their young without harm of human interference. Please check with the park and this document for the most up-to-date information concerning these areas. Note: If a large bird aggressively screeches at and flies around your group then you are too close to it’s nest and should break down and fall back. There are pit toilets by the bridge and at the base of the Morning Glory wall. All solid human waste must be otherwise packed out as to preserve the delicate desert environment. 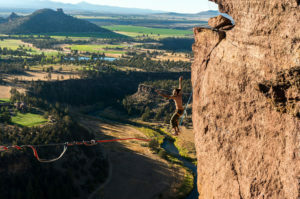 Both State Park officials and Oregon Slackline Access have received many complaints about noise levels from highliners. As sound carries and echoes quite far and wide from the high points at Smith, please keep any bursts of yelling at a minimum. Thanks to improved stewardship and conduct, slackliner assisted park cleanups, and OSA/Park meetings, there is a lot of hope for the future of highlining at Smith Rock. It’s also worth tipping our hats to the climbing community in their trailblazing efforts towards adventure sport access within Smith. Historic efforts by the climbing community have helped to establish acceptance towards both gear stashes and bolt presence. Years of effort by climbers and recently highliners have also helped to establish access trails all over the park. Looking to the future, there are two primary fronts for highline access. First, Oregon State Parks is in the process of authoring a new management “Master Plan” for Smith Rock. Generally speaking, this document will guide park policy within the park for the next 20 years. Fortunately, OSA is on an advisory board for this process and will represent Highliner interests to State Parks as needed in this process. The authorship of the new Master Plan is expected to take into 2018 to complete. Secondly OSA continues to have have dialogs with the park about policy issues outside of the Master Plan process which have recently resulted in seasonally available consecutive-day highline rigging approval. We will continue to stay in touch with the park and work towards whatever policy improvements the community needs both in stride with and outside of the Master Plan process. All updates will be shared to our local facebook group and through conservation and advocacy partners such as Slackline.us. First, please follow all current regulations and best practices within the park. Second, we’re always open to new ideas about how to best help the park receive slackliners well and to advocate for our own needs. If you have any good ones, send us a message! Lastly, please consider donating to Slackline.US to protect the future of highlining in all of our treasured spaces.